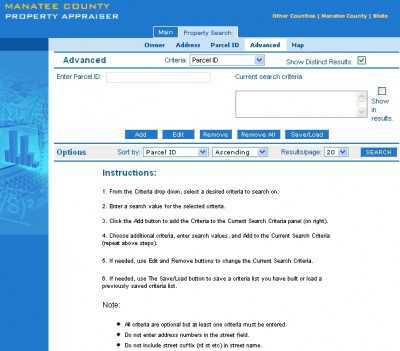 The Manatee County Property Appraiser’s Public Access System is found online at Manateepao.com. 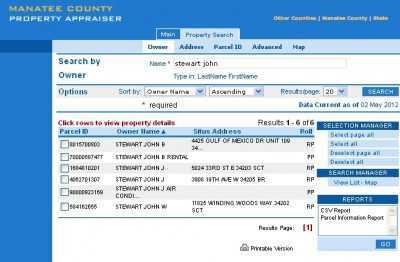 This site lets you view everything from land records and reports to codes, forms and tables. These can all be accessed on the main page, and a tool for searching properties is included for you to find what you need as speedily as possible. You are asked to supply both the last and the first name of the owner, and it’s also possible to look for properties both by address number and by Parcel ID. Results can then be arranged both in ascending and descending order, and you can see as much as 25 results in the same page. And if you still fail to find what you’re looking for, then you can quickly carry an advanced search. This lets you add and remove criteria as you see fit, including the year the property has been built, the neighborhood where it’s located, it’s sale qualifications and the number of bedrooms and bathrooms that it has. All in all, more than 30 different search criteria can be used and combined as you see fit. It doesn’t matter if you know very little about the property you need to find, you can look it up from so many angles on Manateepao.com that you’re surely not walking away from the site empty-handed. The Manatee County Property Appraiser’s office is located at 915 4th Ave. W., Bradenton, FL 34205. And in case you need it, its main phone number is 941-748-8208. Faxes can be sent to 941-742-5664.